I really enjoyed sailing the Sonntag SL-P series in the bigger sizes, during the first tests in April 2010 hitting 32kn with a 48cm fin was new for me. The whole summer I used a SL-P 44cm underneath the iSonic 111 + Severne Reflex 7.0, a very big fin for that combination, but very good in lightwinds. SL-P in a few words, a powerfull findesign which comes in different stiffnesses.With the possibility to change stiffness and rake it is possible to finetune the fin for specific conditions-rider-board, or just make a very good allrounder. Just send Joerg&Alex an email and you will get the best solution (based on team experience). 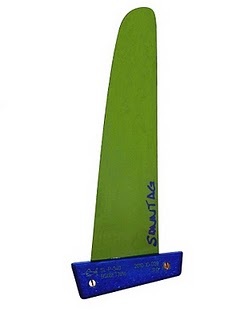 The best news was when we decided to also build smaller SL-P fins down to 33cm lenght. I tried the SL-P 35cm and it was more speed, and too easy. I know this experience sounds like marketing (but its true), I almost sailed directly back after the first speedrun to shore (because I was thinking this is way to slow for the given conditions). During sailing back to the parking space I looked on the GPS (it beeped a lot), saw a 35kn run instead of the 30kn feeling... new PR on the iSonic 107, immediate gybed and did another speedrun back to check if it was true, yeah the next run was 34kn. It has a bit the select behaviour, but not needing the weight and strenght to control and get all potential out of it in gusts. I should get some small SL-P fins to test/try for people that are interested to buy. I am not near done testing the smaller SL-P potential in different conditions, but I have planned some PR attempts on hour/ NM/ distance when conditions allow.